Vanishing Arctic sea ice, dogged weather systems over Greenland, far-flung surface ice melting on the massive island - these trends and global sea-level rise are linked by climate change, according to a new paper. in the Journal of Climate. That, in turn, fuels sea-level rise, and the authors say rising seas are a "monstrous" issue for coastal communities around the world. The increased melting on the Greenland ice sheet in recent years may also be linked to cooler-than-normal ocean temperatures south of the island, slowing ocean circulation. Since 2009, most of the increased rate of Greenland ice loss has stemmed from greater surface melting, heightening concerns that sea level-rise could accelerate beyond most projections and boost threat levels for coastal communities, the study says. 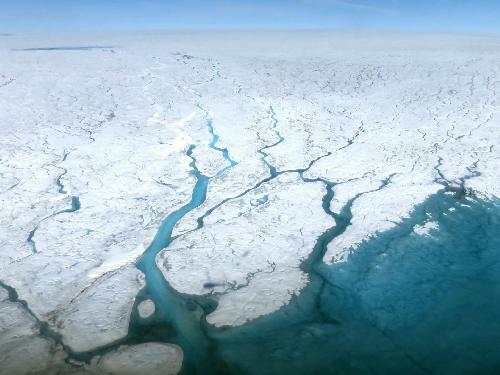 Last July 4th, the Greenland melt area covered more than half of its ice sheet for the first time since July 2012, according to the National Oceanic and Atmospheric Administration. "I think this study does a good job of pinning down the fact that the [Arctic sea] ice is disappearing for a whole bunch of reasons - and that is causing the surface of Greenland's melt area to increase," says co-author Jennifer Francis, a professor in Rutgers University's Department of Marine and Coastal Sciences. Sea-level rise is already "becoming very conspicuous and it's going to be bad. It's happening faster and faster as my Rutgers colleagues have been measuring," Francis said. "This change is accelerating." According to Francis, blocking-high pressure systems over Greenland usually form when a lot of warm air is in the Arctic. And so far this year, it's been extremely warm and Arctic sea ice has been at record low levels for this time of year. The jet stream can take "such a big northward swing that it actually kind of breaks off and forms a closed circulation," she said. Blocking highs tend to be persistent and are hard to forecast, she added. "Whenever there's a big melt year in Greenland, on the surface anyway, it's usually because there's either a blocking high or a large northward swing in the jet stream and both of those things tend to be long-lived features in the circulation," she said. Both transport a lot of heat, moisture and clouds over the Greenland ice sheet, leading to more melting. The increased melting may lead to a slowdown of the circulation in the North Atlantic ocean, she said. A large pool of abnormally cool ocean water south of Greenland that could slow circulation was first observed in late 2013. Time will tell whether it's more than a temporary phenomenon.